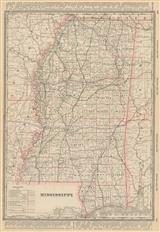 Description: Mississippi Territory. Important early American map of the region. Coloured. 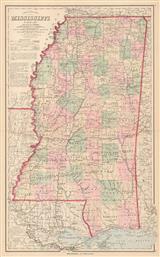 Description: The Mississippi Territory which ultimately became the States of Mississippi and Alabama. Coloured. 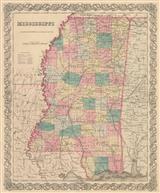 Description: Rare map of the state with original outline hand colouring. Decorative cartouche. Description: Mississippi. 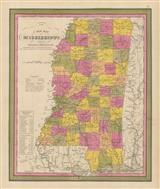 State map surrounded by historical and statistical information. Original colour. 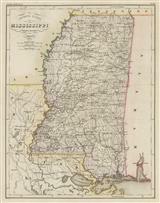 Description: Sketch map showing the sources of the Mississippi River. Black and white. Description: Mississippi. With steamboat routes, roads, and distances between major towns. Original colour. Description: Mississippi. Detailed state map. Original Colour. Description: Mississippi. Pictorial map with vignettes. Original colour. 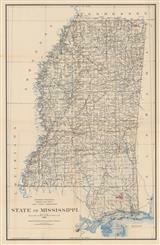 Description: Large railway map of Mississippi, with reference panels on outer edges and colour key by title. Printed colour.